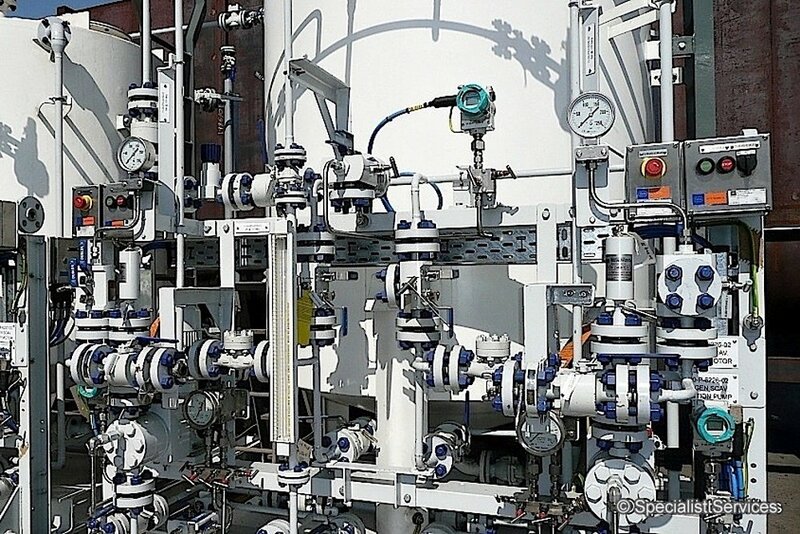 Based on our in-house expertise in engineering, design, fabrication and packaging we can deliver a number of Process Equipment Packages that provide our clients with certified, flexible and cost effective equipment solutions. 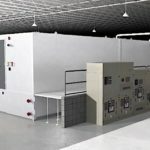 We can provide off-the-shelf solutions as well as exclusive designs for unique needs manufactured according to specific client requirements. 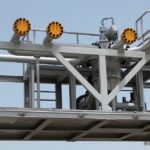 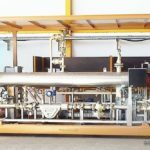 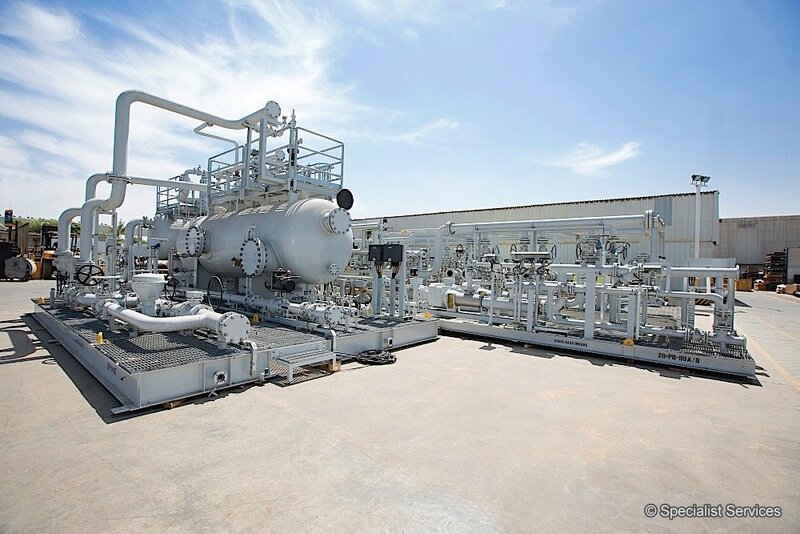 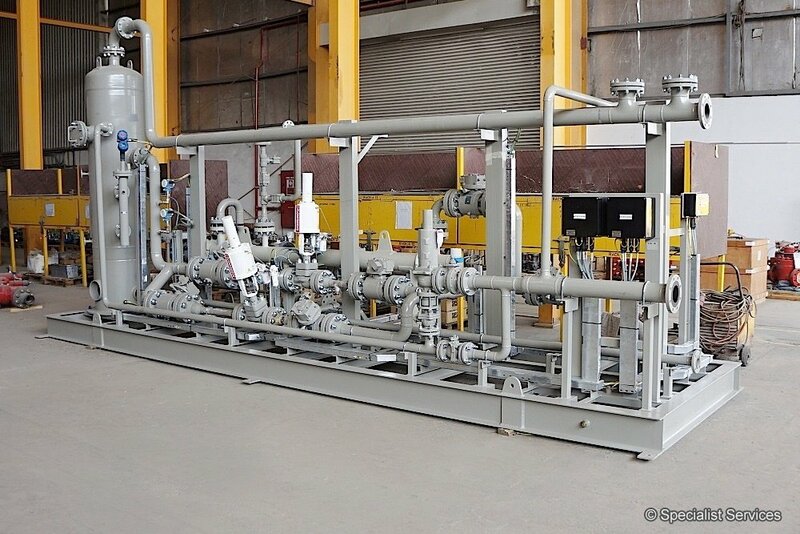 Specialist Services Gas Conditioning Skids perform two functions; remove all liquid droplets and solid contaminants from the gas and adjust the gas temperature. 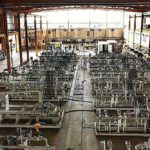 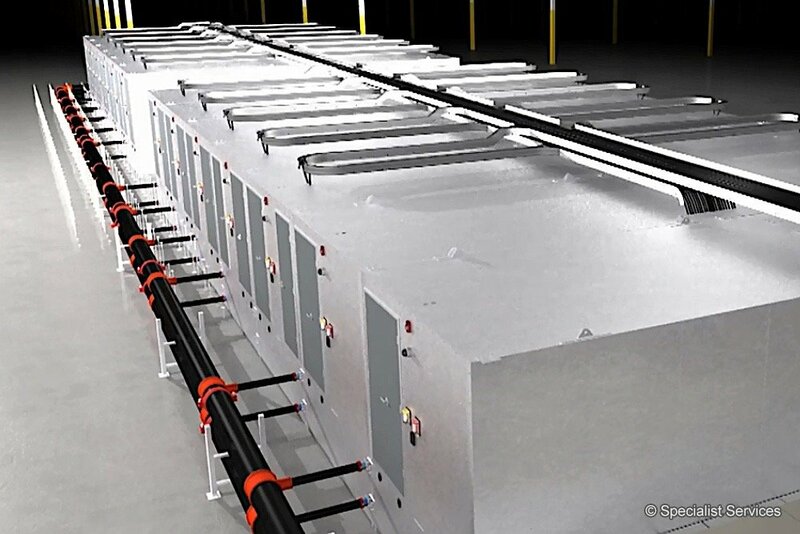 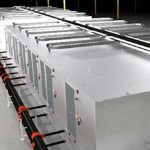 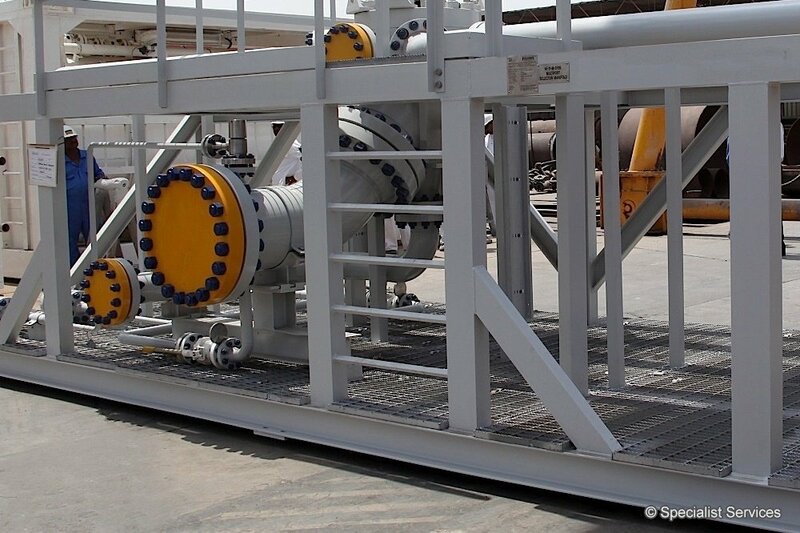 All of the system components and piping are skid mounted for transport and installation. 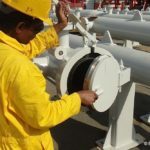 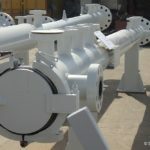 Specialist Services Pig Launchers and Receivers are built as per ASME section VIII / ASME B31.4 / B31.8 for pressure rating class of 150psi through to 2500psi, using carbon steel, stainless, API and alloy steel materials for pipe ranging from 3” to 56”. 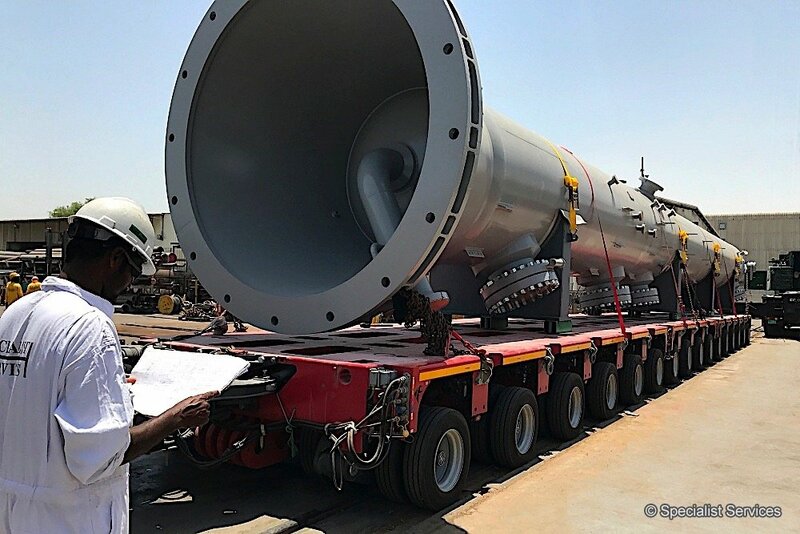 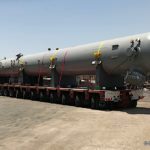 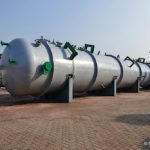 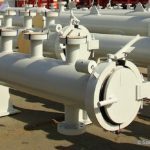 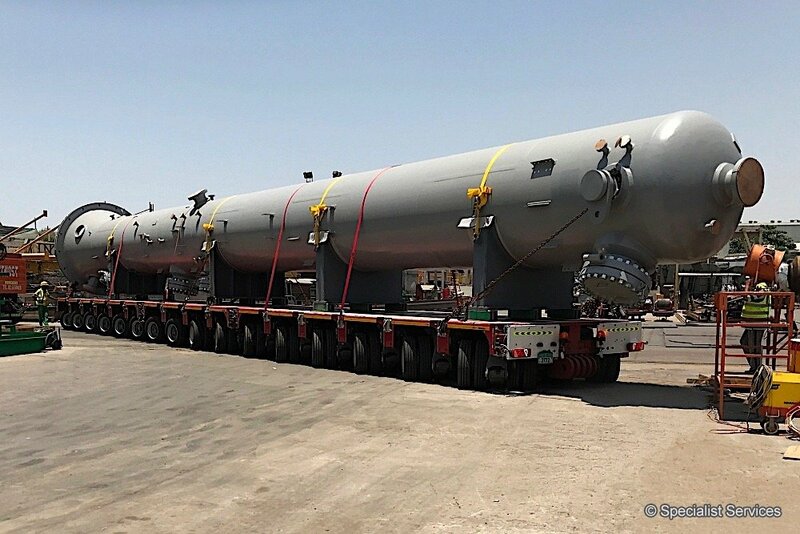 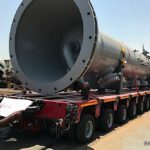 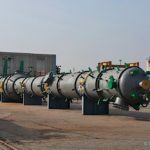 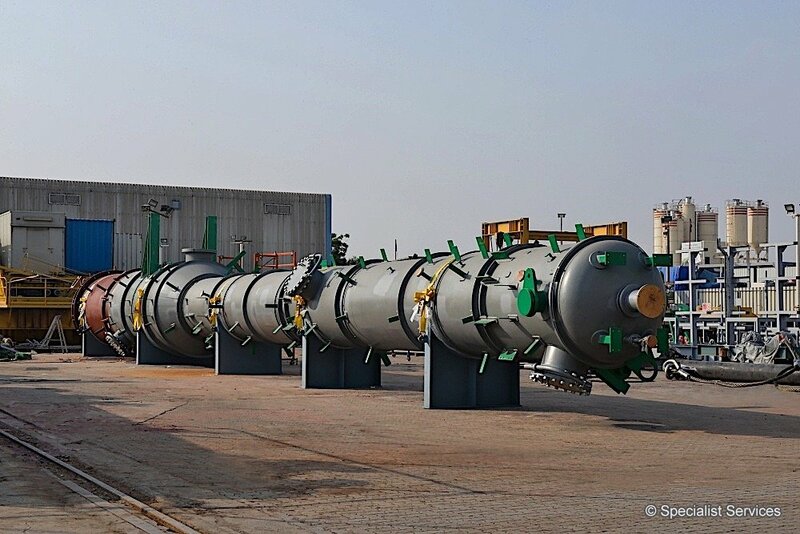 We have the capability and extensive knowledge n carrying out engineering, procurement and manufacturing of Pressure Vessels (coded / non coded) in compliance with international codes and standards, in line with customers’ specifications and project requirements. 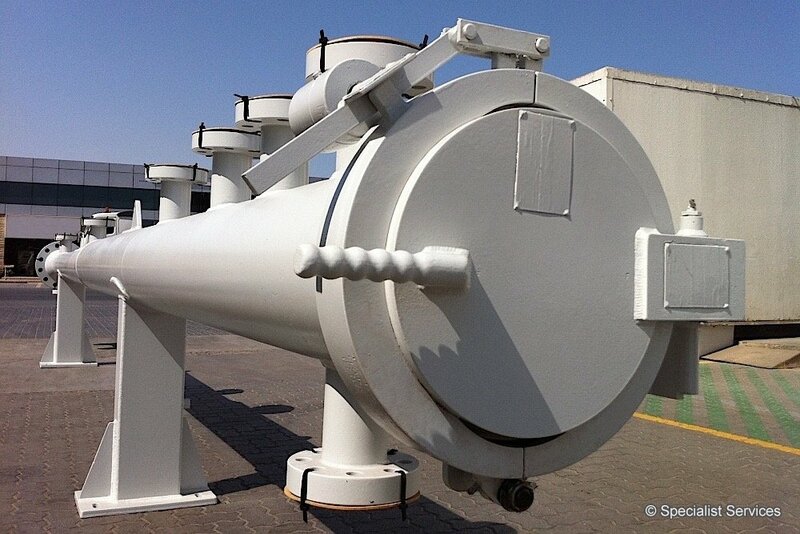 We are certified for ASME U, U2 and S, National Board R and NB. 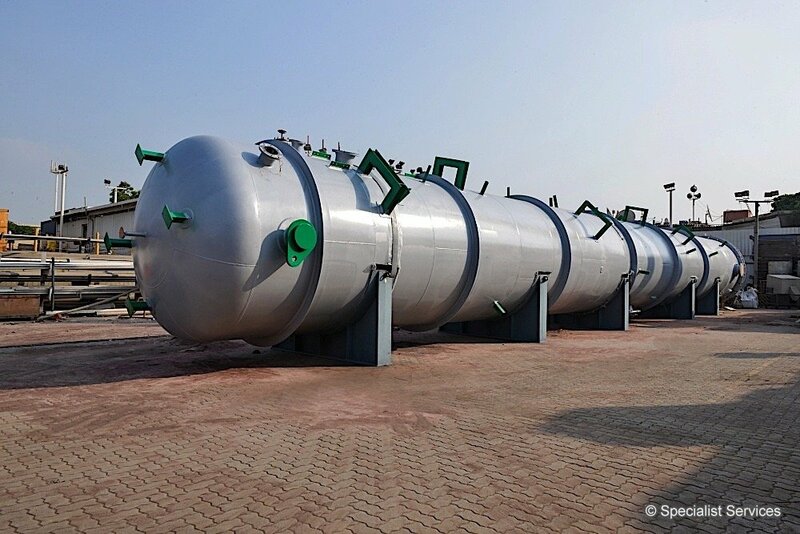 We are capable of manufacturing pressure vessels in different materials, such as CS, SS, CS + Clad (in SS 316L, Alloy 625, Alloy 825 etc. 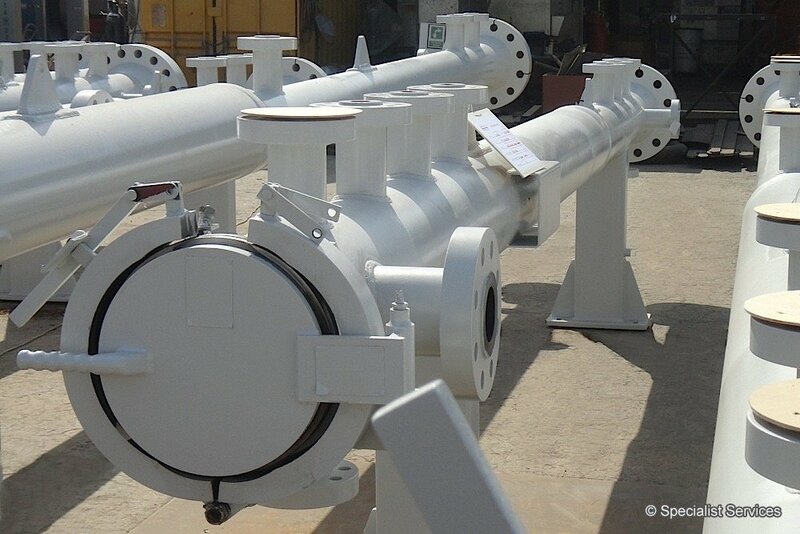 ), and with thickness ranging from 3mm to 100mm or more. 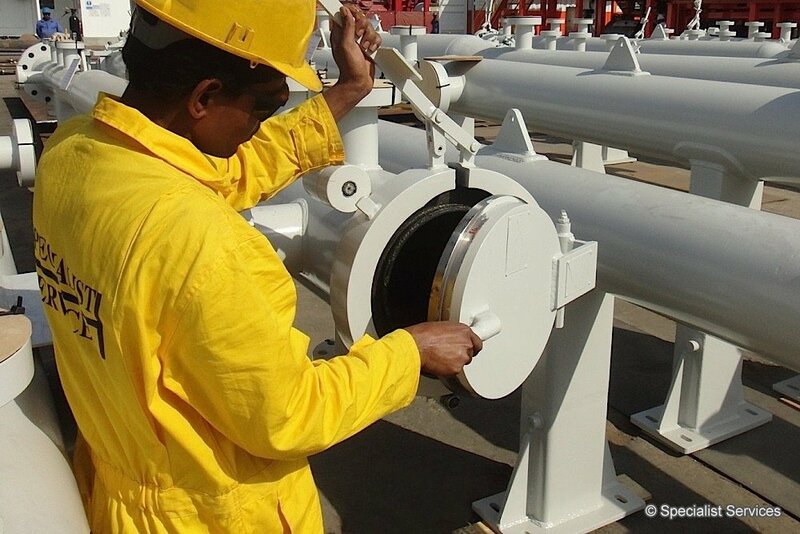 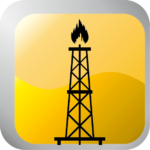 We cater services to Upstream, Mid and Downstream industries, including oil field service companies, EPC’s, OEM’s etc. 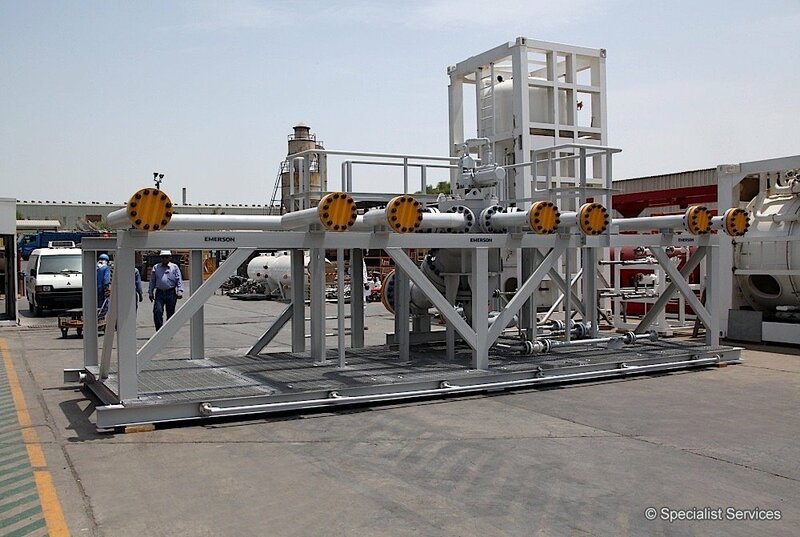 We have the required approvals in place with all end users in the MENA region. 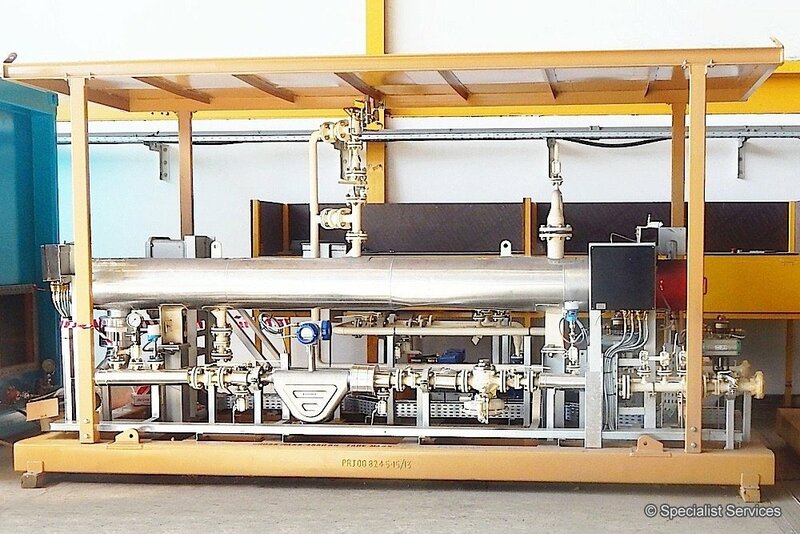 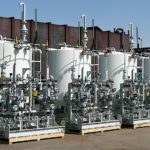 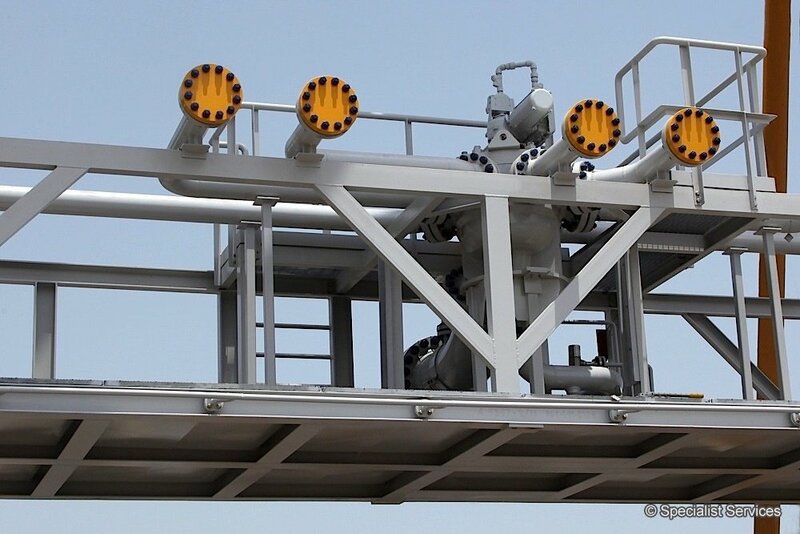 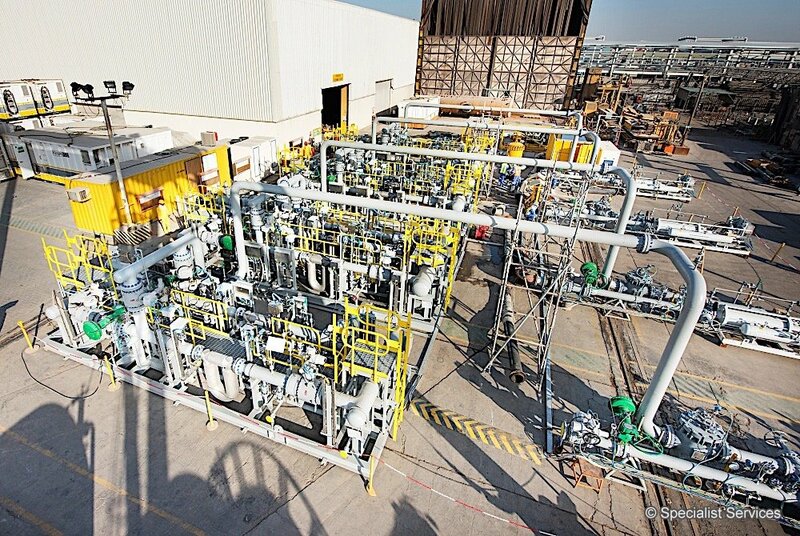 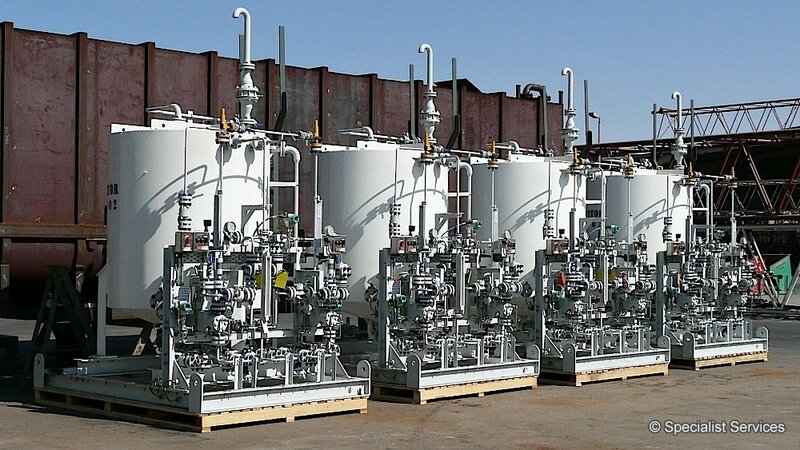 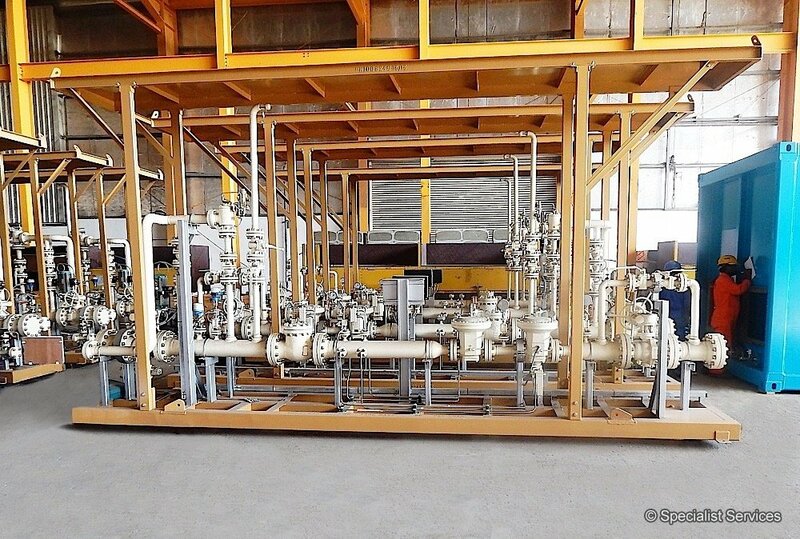 Our Chemical Injection Skids facilitate process flow to improve process stream characteristics or improve oil recovery. 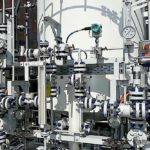 Specialist Services can timely deliver high quality, sophisticated Chemical Injection Packages that comply with international standards. 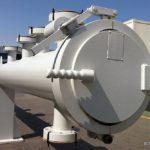 We can also provide Multi-Compartmental Tank Skids for handling various chemicals and Multipoint Injection Skids where space is a main constraint. 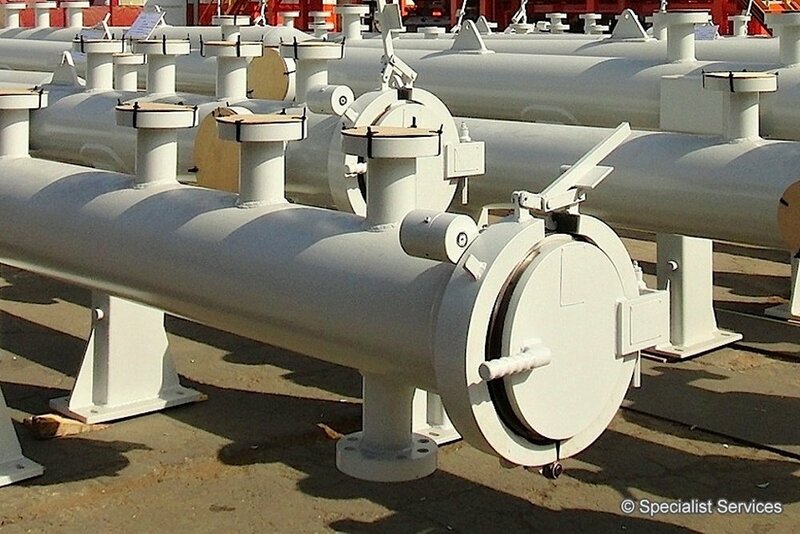 Specialist Services can provide a full range (ultrasonic, coriolis, turbine or orifice type of meters) of pre-fabricated Metering Skids with no site welding requirement as per client specifications. 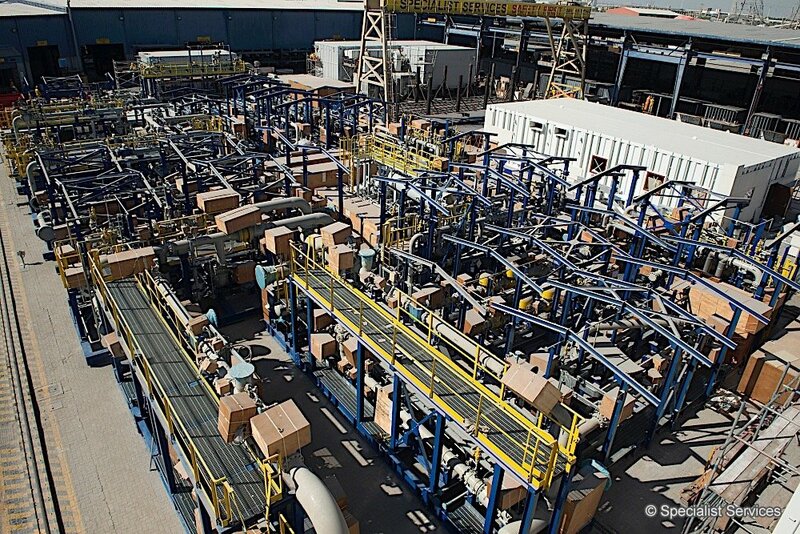 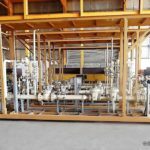 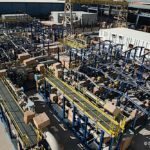 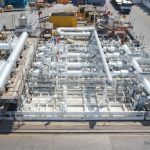 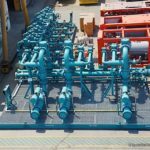 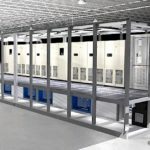 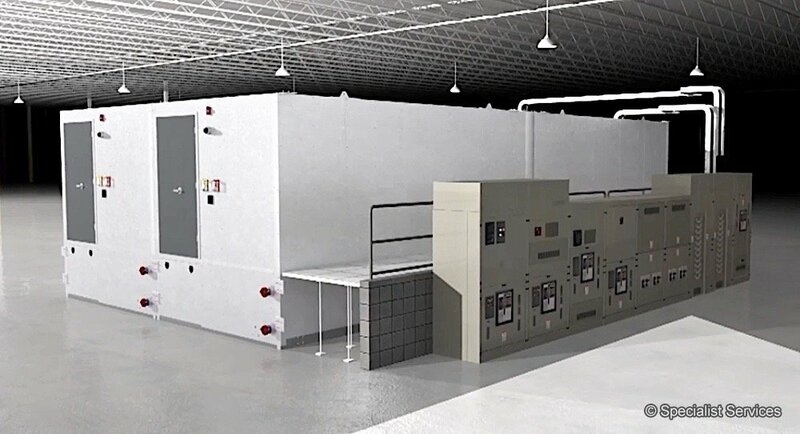 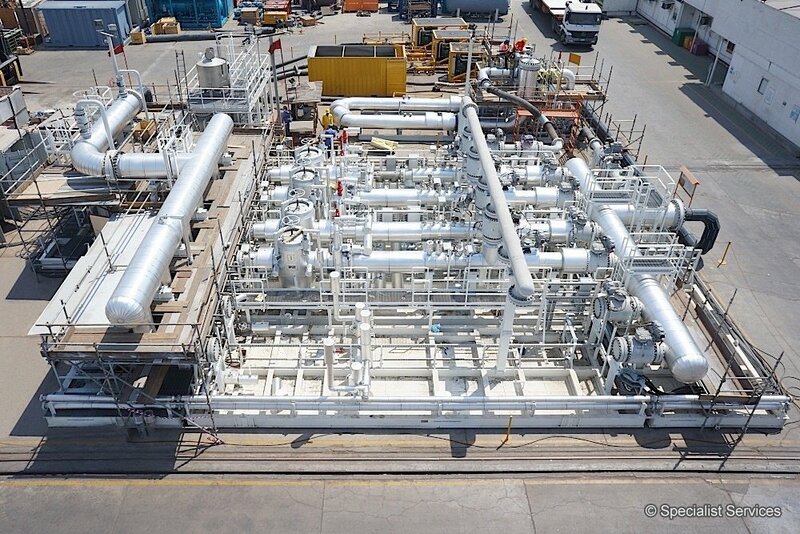 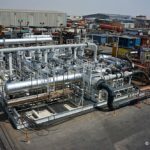 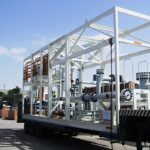 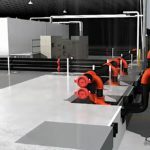 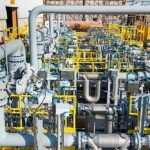 Our complete solutions include engineering, material selection, system side (Flow Computer, SCADA, HMI and others), procurement, fabrication and site support for skid packages. 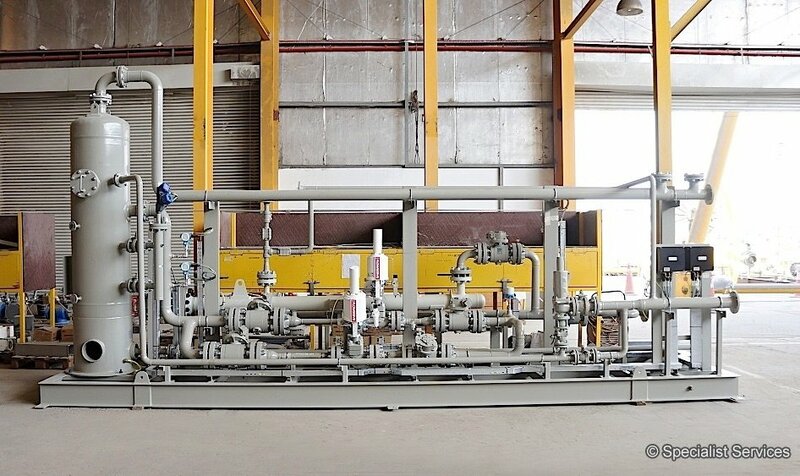 The Multiport Flow Selector (MPFS) allows the selecting and diverting of well fluids from a single well to a single test unit, flow loop or sampling device. 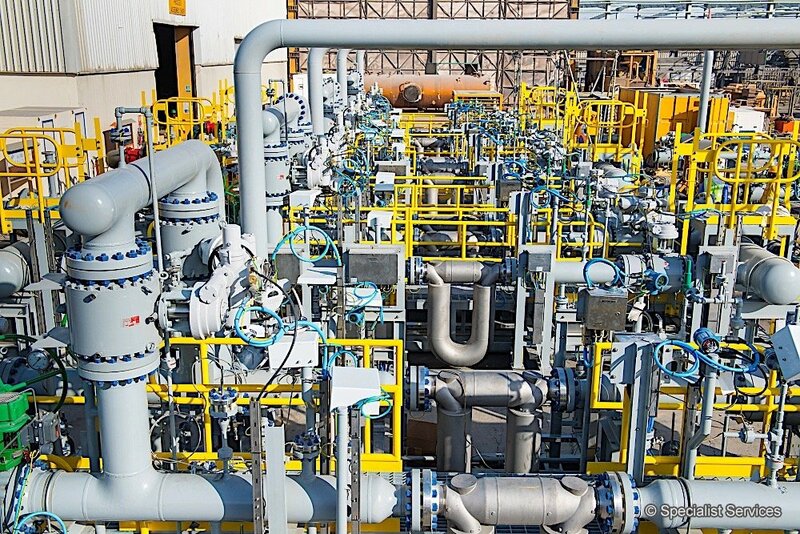 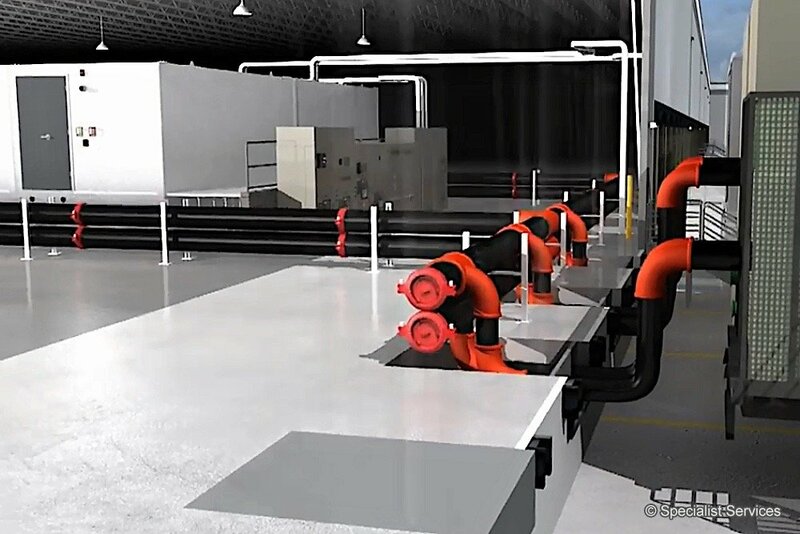 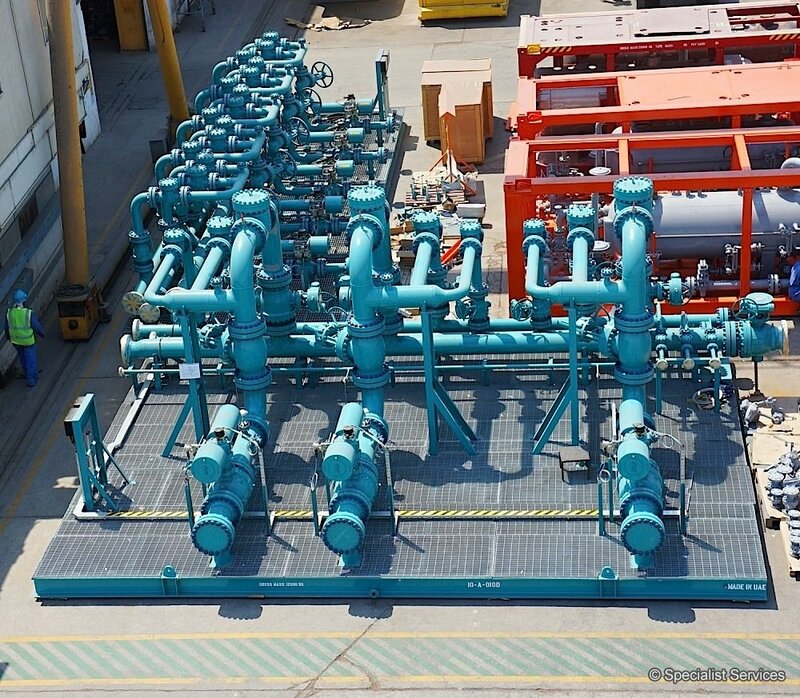 Instead of 21 separate valves required with a seven-line manifold, the MPFS requires only one valve for each of the lines. 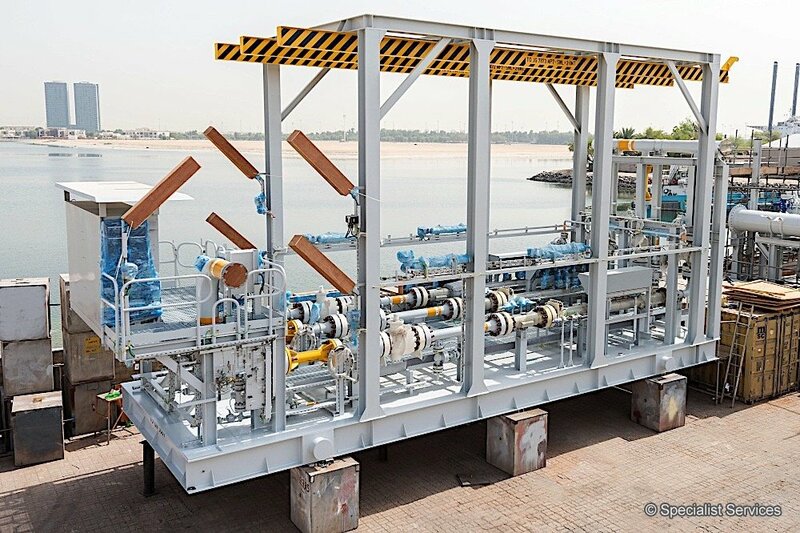 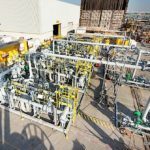 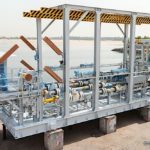 The device is more compact, requires much less piping, is less expensive with only one-third of the required valves, and is considerably lighter—a critical factor on many offshore topsides installations. 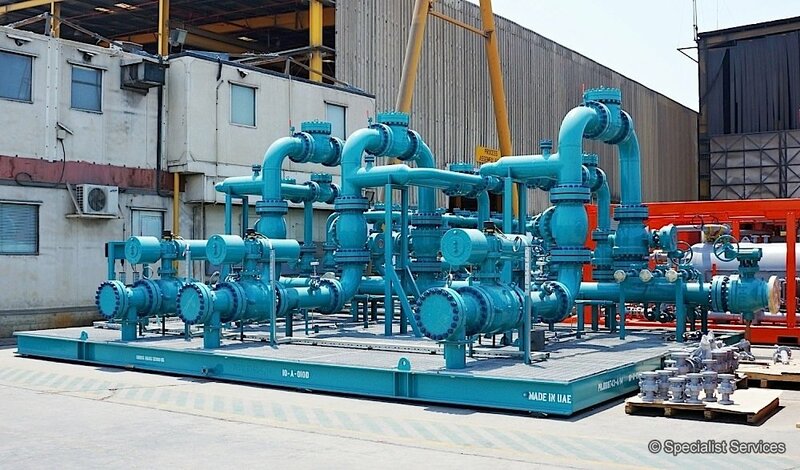 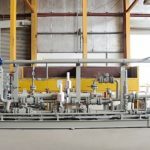 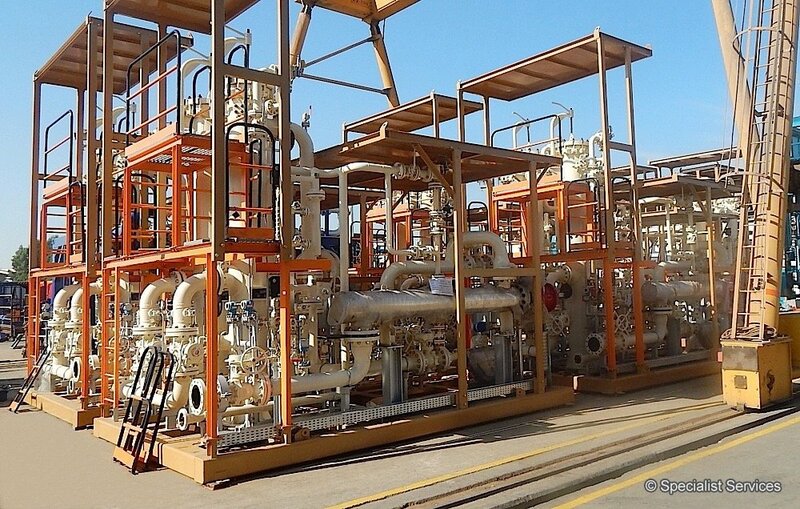 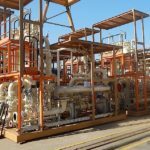 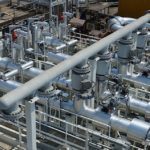 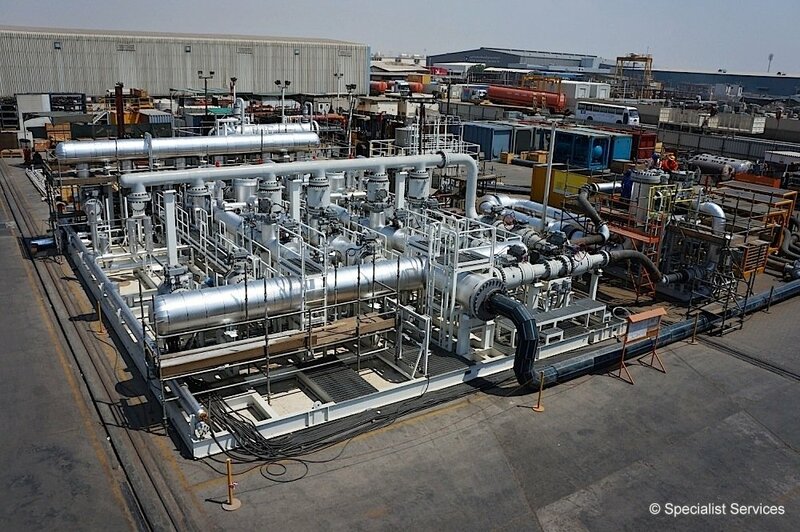 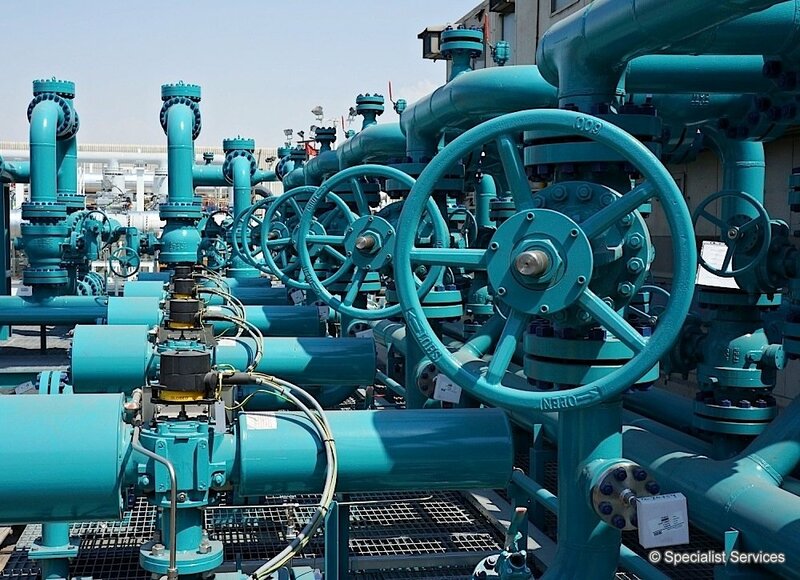 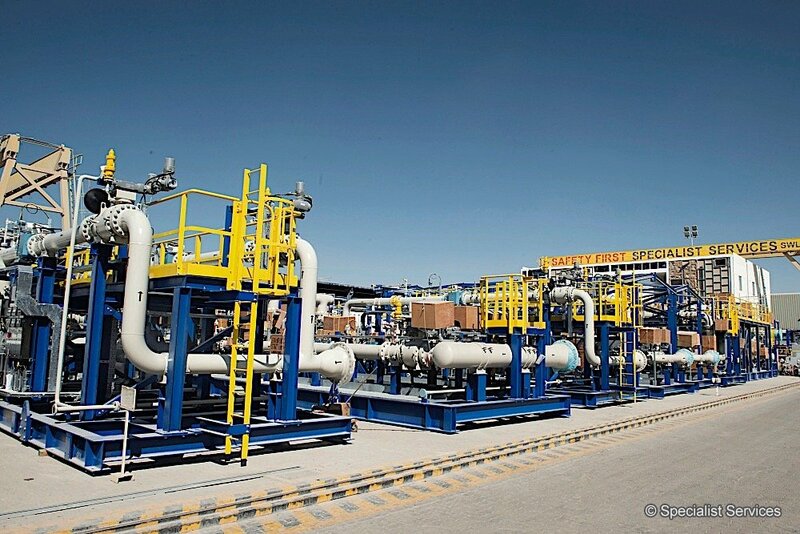 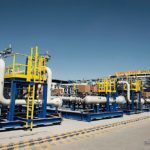 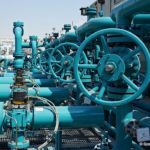 Specialist Services has the capability and extensive knowledge in carrying out engineering, procurement and manufacturing of Inlet Manifolds (test / production) in compliance with international codes and standards, customers’ specifications and project requirements. 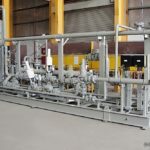 Engineered and manufactured to incorporate client specific requirements our Skid-Mounted Pressure Reduction Package integrates the functions of regulating, metering, monitoring, tele-metering, remote control, noise elimination, odorising, heating and safety protection. 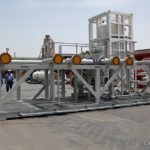 Our Pressure Reduction Skids benefits include a compact structure, safety gas supply, complete functions and low investment. 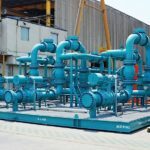 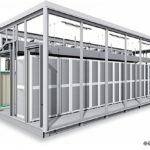 We engineer, manufacture, test and supply complete Chilled Water Systems suitable for Data Centres in line with international codes and standards. 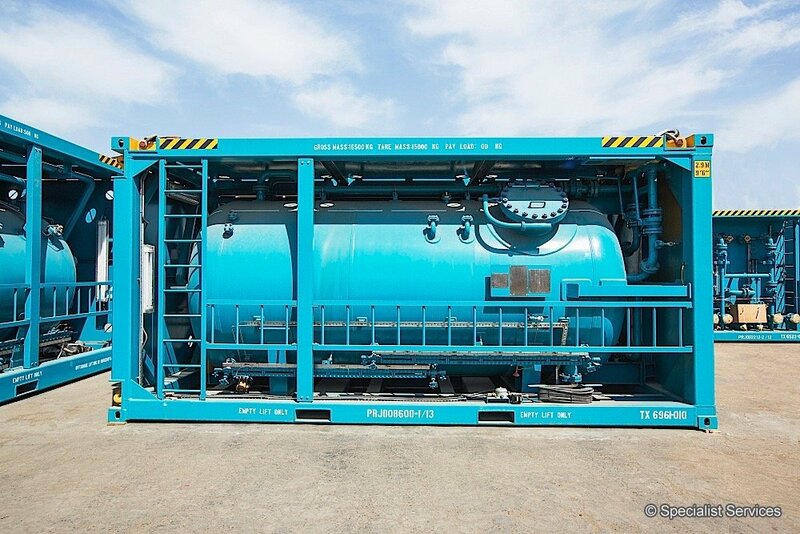 Understanding our clients’ requirements, our Chilled Water Systems are designed for easy on site handling and transportation, as they will be located in confined spaces and limited lifting options. 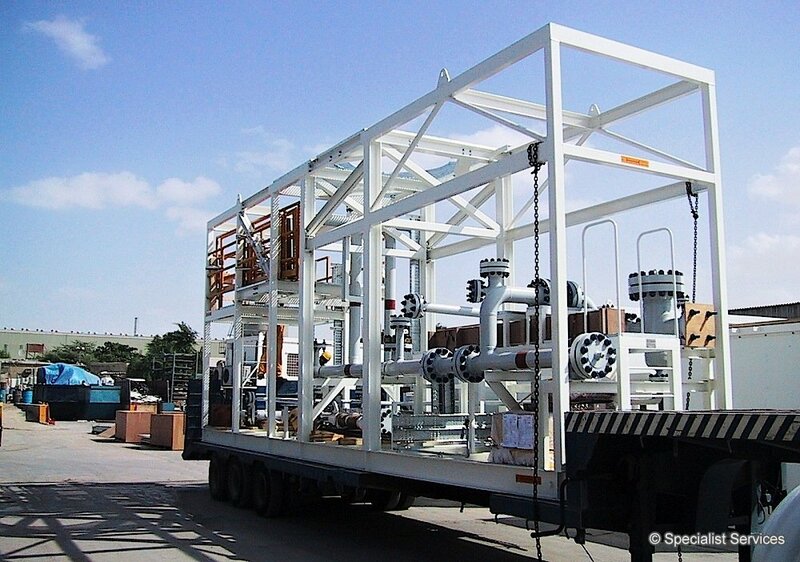 Our systems are used to flow the chilled water and condensate it through multiple equipment. 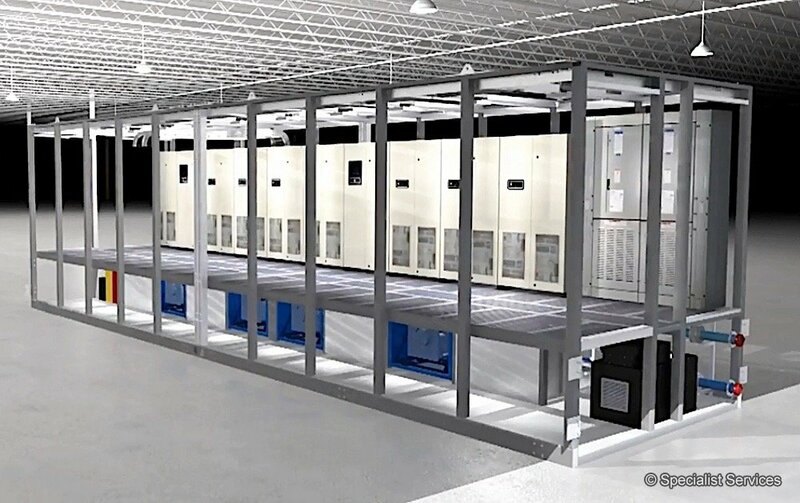 This allows to keep the Data Centre at a very low temperature, which is critical for servers’ proper functionality. 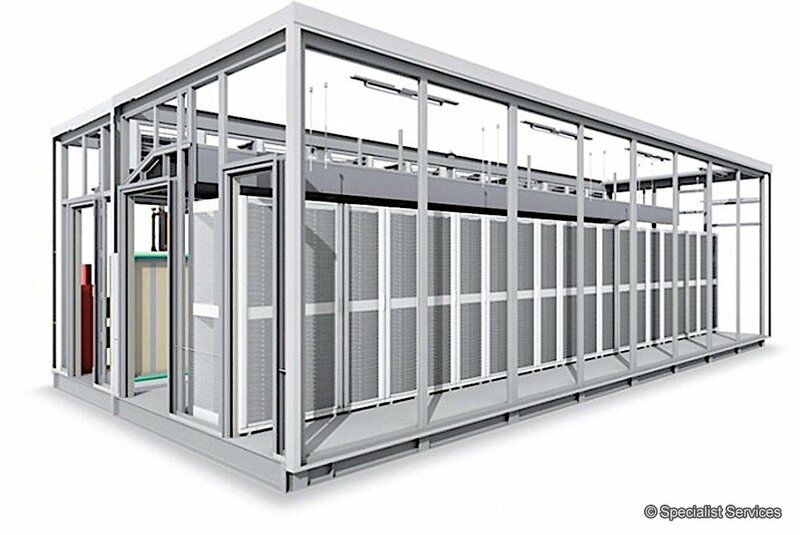 All of our products are fully supported by our engineering, quality and data book systems. 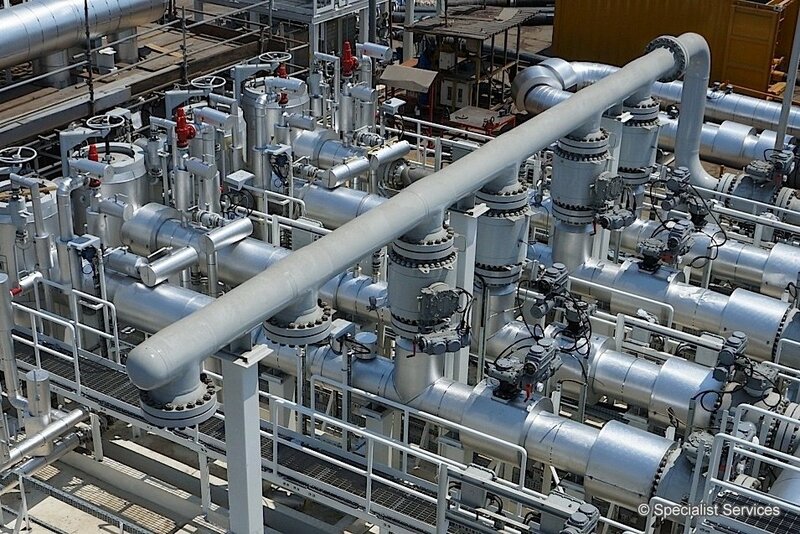 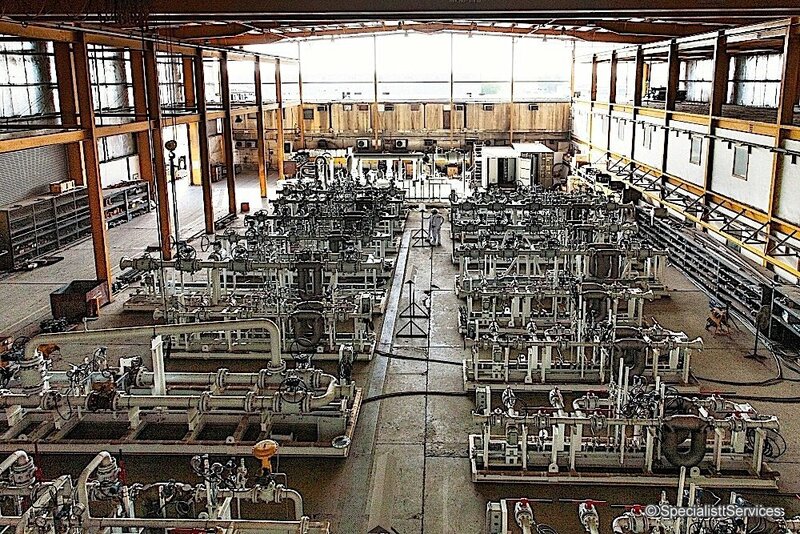 Because of our varied expertise in the Process Equipment field, we are your one-stop-shop for all your equipment design, fabrication and project management needs. 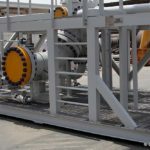 Complete range of engineered pressure control solutions to safely manage the pressure barrier in the well, ensure wellbore integrity and drill more efficiently. 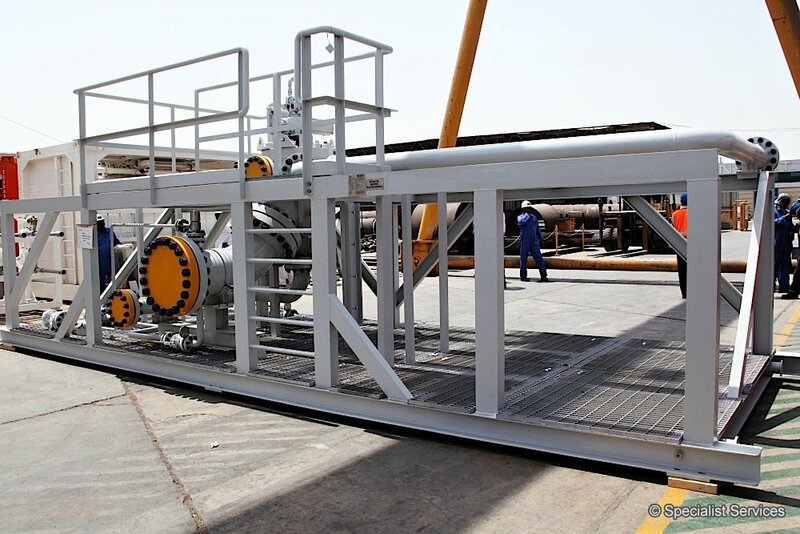 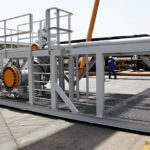 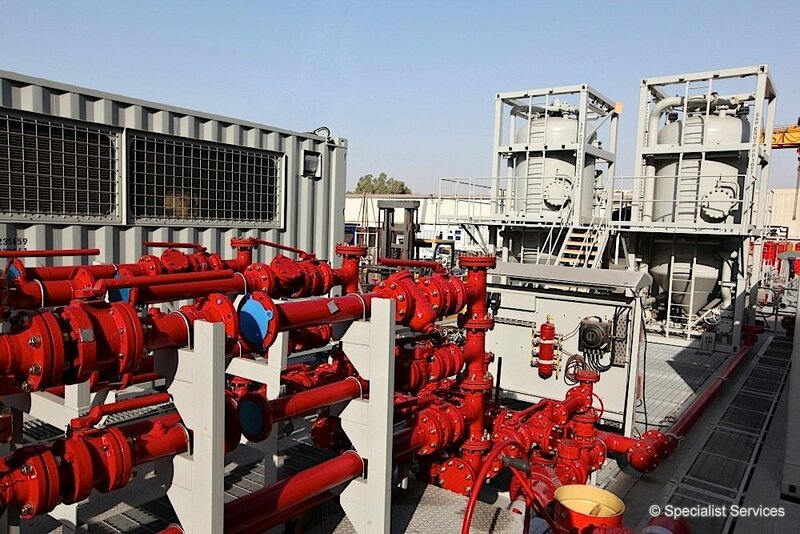 Specialist Services provides a complete package of Early Production Facilities (EPF) that enables customers to bring wells on production faster.